Flirty Texts for Her : It’s not an easy task to impress a girl. But its also not so difficult as many men think it is. Flirting is not a thing that only a few selected men can do. In fact, anyone can flirt with a girl over text. You just have to know the right things that girls love to here. Flirty text messages are great texts to win over a girl and melt her heart. You just have to be a little much tricky about choosing words for flirty text messages to send a girl. Sometimes the simple words can turn her on and seduce her to the point when she really grows a genuine interest in you. Even some regular words can be made romantic if you know how to use them in your flirty texts. Here are some examples of cute flirty text messages for her and romantic flirty text messages for your crush. Simply take the best flirty text messages for her and send to make her laugh or get her in the mood. I want to hold you, touch you and then kiss you just to check if you are actually made of sugar. Because you are so sweet! I met you and realized you have exactly the face that I dream of every night. When I’m with you I wonder If I’m awake Or I’m dreaming! You really give me that teenage feeling of being in love. You can really be my first love because I’ll erase every memory of past to start a new life with you. You must be someone from the future. 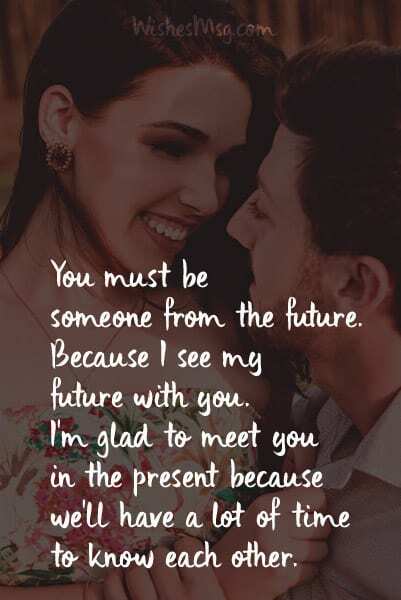 Because I see my future with you. I’m glad to meet you in the present because we’ll have a lot of time to know each other. You don’t always need to die to go to heaven because sometimes angels from heaven come down to bless our lives. Thank you for coming down for me! You stole my heart and I didn’t say anything. But you are stealing my sleep too! Now, it has started to bother me really. Why stealing sleep when we can have it together! I have a very strange thought tonight. I know Someone will win you over someday. Why don’t you let me try? Let’s see where it gets us! Now I’m convinced that cuteness can be a killer. I have injured my heart with your innocence. There’re only two cures for it. Be mine forever or let me be yours forever! I thought my heart was made of stone. But I never knew your beauty could melt a stone like a wax. Please save my melting heart! What’s so special about dreams that you can’t make into a reality? I dreamt of holding you in my arms. Now I want to make this real. Will you help me in that? 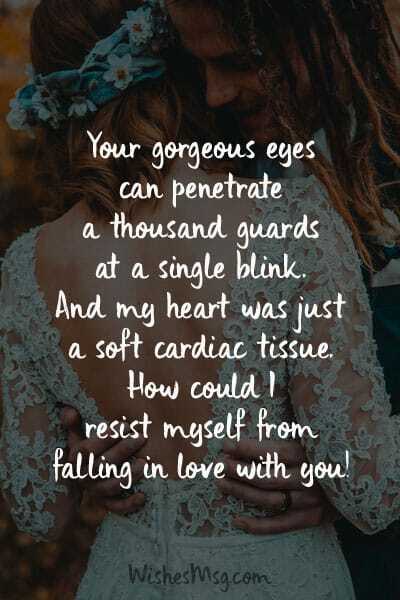 Your gorgeous eyes can penetrate a thousand guards at a single blink. And my heart was just a soft cardiac tissue. How could I resist myself from falling in love with you! Your body is like a temple and your face is like a bible. I really would enjoy reading a bible sitting inside a temple. And loving you will be my religion! Heaven does not always mean a place to be in. Sometimes it’s a person to be with. For me, heaven is being with you all the time! I have some romantic fantasies about you and each one they start with a candlelight dinner. If you want to know all about them, come to join me for a candlelight dinner. We’ll start from the start. I don’t know what you think of me but I have all kinds weird fantasies about you. Some of them include hugging and kissing but some of them are even more romantic! I was wondering if I want to book a seat in your heart will I have to wait in the queue or I’ll get some extra privilege because we are friends? You stole my heart without my permission and I fell in love without your permission. Now I ask for your permission to marry you. Will you say yes for that? My life would be so useless if I hadn’t met you. But it would even more useless if you’re not in it forever. I don’t want to live with the regret of losing you even after meeting you in life. I believe sometimes people come from God to bless the lives of those who live in this earth. But tell me, since when God started sending supermodels? If you ever think of getting rid of extra sugars from your body, just let me know. I know the most natural way of doing it. It may sound gross but I love my job! You have a fuller lip, nice legs and a gorgeous face that deserve to be praised. I have some skills which can’t be talked about but only be performed. What a great combination! I’m pretty sure you are having tough times taking care of all the beautiful things about you. Would you consider me for the care-taker post? I would take care of you for free! I can see a lot of beautiful girls around me. But a beautiful lady is rare. I’m glad I have met a beautiful lady like you in real life, not in my dreams! I’m thinking of making my life spicy and full of romance. I’ll start calling you babe from now on. What do you think gorgeous? I was thinking of buying a gorgeous bed cover but my bed says you’ll make a perfect bed cover for it. So, can you please come tonight? You have stolen my heart, my sleep and my thoughts. You have a very little idea of what you have done. Come to my place tonight so we can discuss the ways of you compensating me! You are so lucky that being gorgeous isn’t a crime. If it was, you would be the first woman to be brought into justice. And I’d be the one to turn you to hands of the law. If I was a girl I would be so jealous of you for your beauty. But I’m a man. How can I stop myself from falling in love with you! How can I not desire you in my sleepless nights? Your eyes have the ability to raise a tsunami into the calmest see. Has anyone ever told you what could it do to man’s heart? Even the purest, strongest heart can melt before the beauty of your face. And I’m not even a saint! I can only stop myself from desiring you when I’m dead! No man is a by-born flirting machine. They just master the technique by looking out for text messages on the internet and learning new ways of impressing a woman. You can be one of them too!